I am just sitting here at my desk, listening to two of my girls fight over one of 124639 toys, while the other two watch the latest MLP season on Netflix. It’s a normal evening around here when it’s too hot to venture outside without bursting into flames. 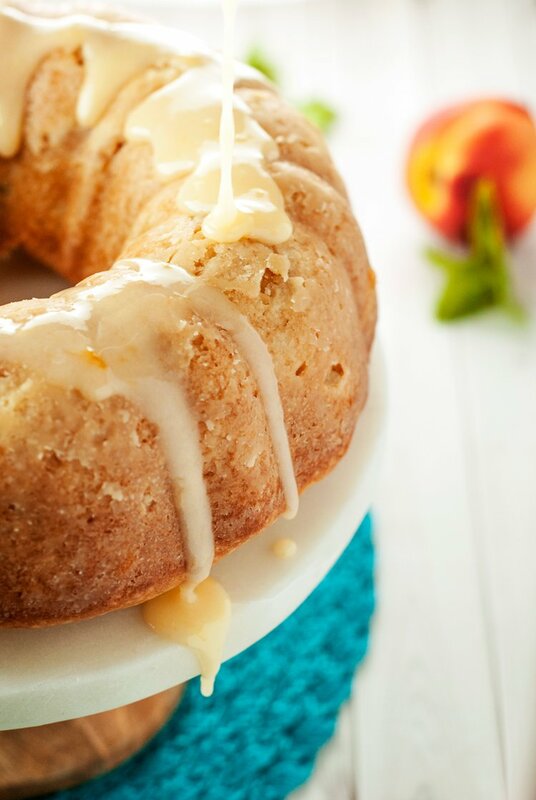 But me, I’m enjoying the amazing fresh produce of summer that I plopped right on into this Peach Mango Bundt Cake. Now, I must admit, I am kind of doing it secretly. Like, it’s hiding in my desk drawer and I sneakily open it and take a bite, then close it before anyone notices. Because if they notice, it’s open season on muh cake, and I want to be sure to actually get a slice this time. Punks always eating my cake, I swear it! Can I mention how this cake is essentially a doubleplus bonus, because I used Silk Non-Dairy Yogurt, which has six grams of plant-powered protein, and Silk Almond Milk, which has no cholesterol, saturated fat, and double the calcium of dairy milk? You can have your cake and eat it too, my friends. Even for breakfast. Cause that’s just how I roll. One thing I learned, though, is that bundt cake pans can come in different sizes. I’m not talking about mini-bundt vs. full bundt, but apparently, depending on the brand, your pan could be a little more shallow, or a little less wide, or both. I used a 10 inch pan for my cake, so please be aware that if you have a smaller pan, you could have overflow if you use all of the batter. Just something to keep in mind, my friends. Oven accidents are no joke! 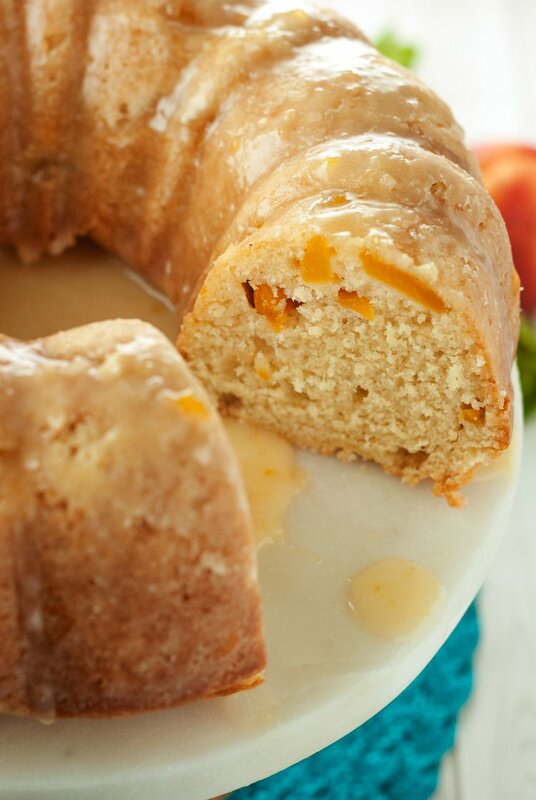 Are you ready to have yourself a Peach Mango Bundt Cake day? Because I totally am. You know, after I finish the one I’m working on right meow. Yum. Preheat oven to 375 degrees. Grease and flour a bundt cake pan, set aside. In a large bowl, sift together the flour, baking soda, and salt, then set aside. In a large mixing bowl, cream the sugar and butter until light and fluffy, around 5 minutes. Add the eggs, one at time, mixing thoroughly before each addition. Stir in the almond milk. Alternate adding the flour mixture and yogurt, stirring until just combined each time. Add the peaches and mango and stir gently to combine. Pour the mixture into the bundt cake pan, then place in the oven. Reduce heat to 325 degrees and bake for 60 minutes, or until a toothpick inserted into the center of the cake comes out clean. Allow to cool for at least 20 minutes before removing from the pan, then allow to cool completely on a wire rack. 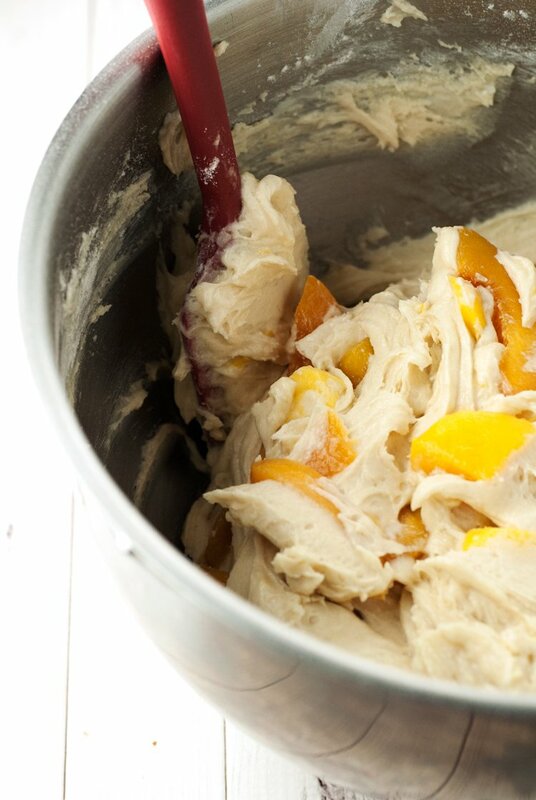 Add the peaches and water to a blender and pulse until smooth. Slowly add the mixture to the powdered sugar, in a small bowl, until it reaches a desired consistency. Drizzle over cake, and enjoy! Bawhahaha, you do the same thing I do. I stash food in my drawer (mostly peanut butter) and sneak bites of it throughout the day. Move over, peanut butter. 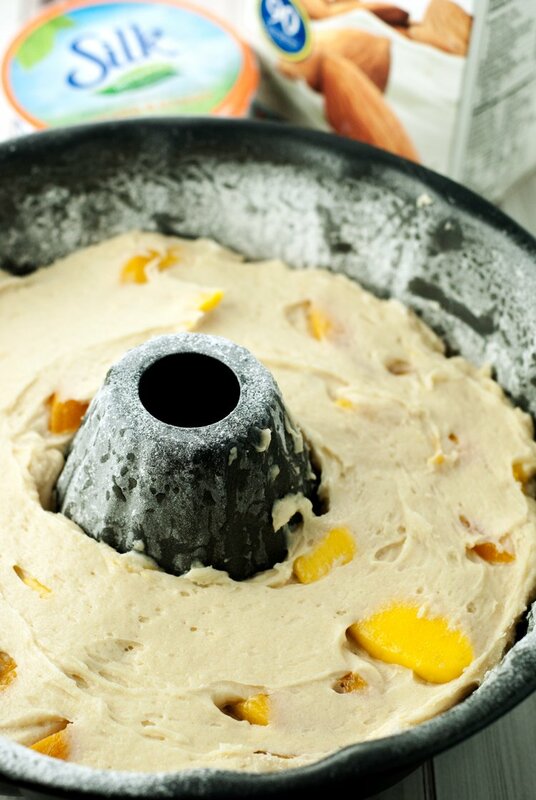 Peach Mango Bundt Cake is taking over. :)This cake looks great, Karly! I LOVE that it's dairy free! LOL! I would definitely hide this cake too so I can make sure I have at least a bite or two! This looks so scrumptious! 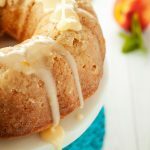 You had me at bundt cake........and peaches.........and mango! Sounds like a delicious flavor combination that I need to try! 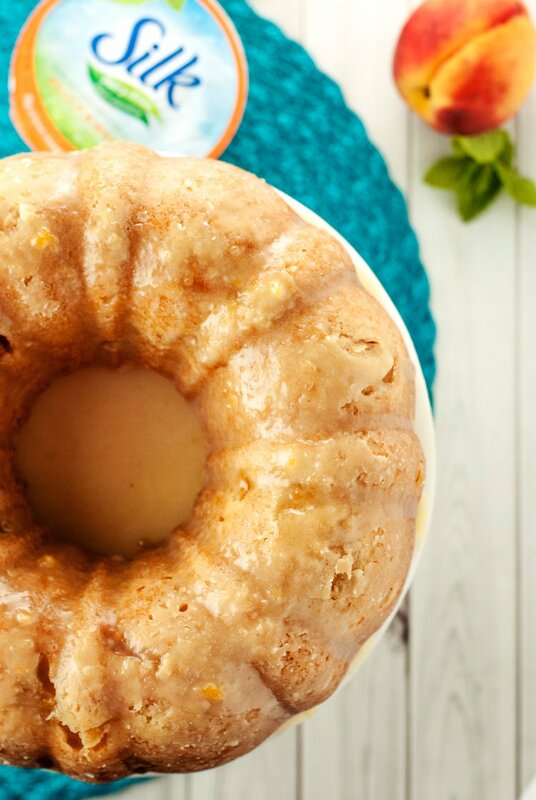 This bundt cake looks magical! Your photos are amazing! Could I sub the fresh fruit with frozen thawed peaches and mangos? Absolutely! I've done it both ways! Sometimes the thawed fruit needs to be pat down lightly, to eliminate the extra water from freezing, but other than that, you're golden! Would flax eggs work with this recipe to make it began? I honestly have no idea, as I've never worked with flax eggs before. If you give it a try, let me know how it turns out! Love mango cakes interesting it try it out with peaches. Looks so delicious.